Martin originally studied the Trombone under the guidance of Peter Gane at the Guildhall School of Music and Drama and was a member of The National Youth Orchestra and European Youth Orchestra, where he performed under some of the world’s leading conductors. Martin has had a long and illustrious career in the brass band movement stretching over thirty years, conducting and adjudicating brass bands, winning many prizes at all levels of band competitions. Martin’s conducting career has led to spells as M.D with The Yorkshire Imperial Band, Blidworth Welfare Band, Thoresby Colliery Band, Nottingham City Transport Band, Desford and in his early career two bands in the home counties, namely Aveley Band and the Welwyn Garden City Band. In March 2018 Martin was appointed as the new Musical Director of the Skelmanthorpe Band. 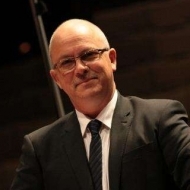 Until December 2015 Martin had worked at the Brunts Academy in Mansfield for over 20 years as Director of Music , Director of Specialism for the Creative and Performing Arts before joining the leadership team in 2009 as Deputy Head. Martin is currently self-employed as a Marketing and Business Education Consultant. Martin became a member of AoBBA after successfully completing the trainee mentoring scheme in 2017 and has had a busy 2018 adjudicating at the National Youth Championships, Butlins and the LBBA Slow Melody Contests.